Yesterday afternoon before we were to leave for a movie, I walked into our bedroom where Kate was editing photos on her laptop. I said, “We’ll need to leave in about 5 minutes.” She yelled at me that she was ready. When that time had lapsed, I went to get her. She still seemed quite irritated. That continued in the car as we drove to the theater. I don’t recall exactly what she said, but she expressed her displeasure at the way I rush her when we are going places. As we started walking toward the theater from the parking garage, she said, “You tease me enough. I should be able to tease you.” She held my hand. Then as we sat in the theater, she also held my hand. It is as though she really was angry but tried to cover by suggesting she was teasing. Then she began to express her apology not in words but by being loving. This morning Kate and I were awake at 7:15. I brought her some orange juice and a breakfast bar around 7:45 and told her the family was just now coming to the kitchen. She thought I was asking her to come on downstairs and asked, “I’ll be able to see them later, won’t I?” I told her yes. She remained in bed using her laptop. She remained there until close to 11:00. She came downstairs and started editing photos on her laptop. Sometime around noon, she went back upstairs. I just checked in on her and found that she was resting in bed. It is interesting how much she enjoys being with everyone (I think), but how often she removes herself to rest. I am not sure whether this occurs because she is simply tired or because she isn’t interacting with everyone and gets bored or feels left out. For the most part, each person has been on his/her own today. Jesse has been busy the entire day preparing food for our Thanksgiving dinner. I have remained in the kitchen most of that time working on my iPad and talking with Jesse and Greg. Ron has been playing games on the TV (football, basketball and hockey). Randy has been upstairs almost the entire morning. He is downstairs right now working on his computer. It could be that Kate has simply gotten tired of working on photos. It may be taxing on her. It could also be that she is having a very low-key experience with the family since no one is giving her any special attention. Of course, she hasn’t taken any time in the kitchen except when Jesse gave her a slice of banana nut bread and some fresh blueberries and raspberries. Yesterday she was hurt when we were with the Robinsons in Nashville. We had had a good visit. Near the time to leave, she broke into the conversation and said, “Wait a minute, the three of you have done all the talking. Let me say something.” When we got in the car, she seemed depressed. We didn’t chat about it, but she offered several comments. She mentioned something that I have noticed before but did not notice yesterday. She said Angie and Tom looked at me and addressed all or most of their comments to me. She also said that everybody (even Ellen, her best friend) does this. She said, “I am not dumb.” meaning that she has things to say and contribute to our discussions as much as everyone else. I apologized to her because I had not been sensitive to that and that I would try to direct more conversation her way. I really do believe that my own personality is such that I quickly engage in conversation with other people and don’t think as much about whether or not she is being included. This is something I need to work on. I might think that the behavior of the Robinsons is a result of their knowing that Kate has Alzheimer’s, but the same pattern appears to be true with other people who have no idea of her illness. It may have something to do with the kinds of comments that she makes. Often they don’t tie into anything that we are discussing at the moment. It could also be that there is so little that she can offer to many of our conversations that she is more retiring and gets ignored. At any rate, it is a problem and one that I hope I can offset but fear that this will become a more common pattern. Yesterday morning shortly after I told Kate it was time to get ready for church, she came to me with an outfit and asked, “Is this all right?” This seems a simple enough question, but viewed in context, it is another sign of her decline. She has been and continues to want to be very independent. She often shows signs of resentment when I make suggestions about what she should wear. She does, periodically, ask my opinion. In this particular instance there was something about the way she asked the question that hit me. It sounded very childlike as though she had no idea of what to wear. I think the fact that she was preparing to dress for church which is such a routine event adds to my sense that she is changing. As a caregiver, I have to be very sensitive about what to say, when to intervene, when to let her make her own decisions even when I know it may be different from what I believe is appropriate. I am trying very hard to minimize her boredom now. I am spending less time at the office so that I can be with her more. That permits such things as simply coming over to Panera Bread where we are right now. Here is an example. Today I have a foundation lunch meeting that starts at 11:30. That means I need to get her lunch somewhat earlier than I would do typically when my Rotary club meets at 12:30. For that reason I decided to come home directly from my workout at the Y and take her to Panera where we could both work on our iPads and then get her lunch. Knowing that she often goes outside to work in the yard and that if she did this, we wouldn’t have much time together before I have to leave, I called from the Y to remind her that we were going to Panera. She had forgotten. When I got home, she was waiting in the driveway near the street. When she got in the car, she said, “I didn’t keep you waiting.” This led to a few comments related to her saying that I didn’t give her credit for anything. She then gave me commands as to how to get to Panera’s. She was mimicking the way I do with her. My point in telling the story is that I had simply tried to do something nice for her, but she hadn’t recognized that and, in fact, seemed a little put out with me. During our time here, she said, “The Olive Tree. That is the name of the restaurant where we ate on Saturday with the Harringtons. She had asked me several times but couldn’t remember the name. Then she said, “Katherine.” That is Mark’s wife. That led to her repeating our address, my cell phone number, as well as the names of several high school friends. She was demonstrating that she still remembers things. This is another sign of her own recognition that she is getting more forgetful and is working hard to compensate (remember). That makes me sad too. Last night as I was turning into Ruby Tuesday for dinner, I said to Kate, “Oh, I forgot to bring my $5 off coupon again.” She said with a bit of irritation, “Why don’t you keep it in the car.” Then she went on to say, “I’ve told you at least 3 times to do that. You don’t listen to me.” This led to a further exchange in which I said, “You don’t think I listen to you.” She said, “No, you don’t.” My point in bringing up this episode is that she has never suggested that I keep the coupon in the car. In fact, we have not really discussed this. The only prior mention occurred the last time we were here about 2 weeks ago when I also had forgotten the coupon. Kate did not sleep well last night. At 2:30 this morning she mentioned that she couldn’t sleep. I know she was awake around 4:00 when I woke up again before falling asleep until 5:00. I think she was awake then. I got up at 6:00. She has rested a little since that time, but I really believe she lost a lot of sleep. I asked her a few minutes ago if she had been worried about something. She said she hadn’t and couldn’t figure out why she couldnt sleep. 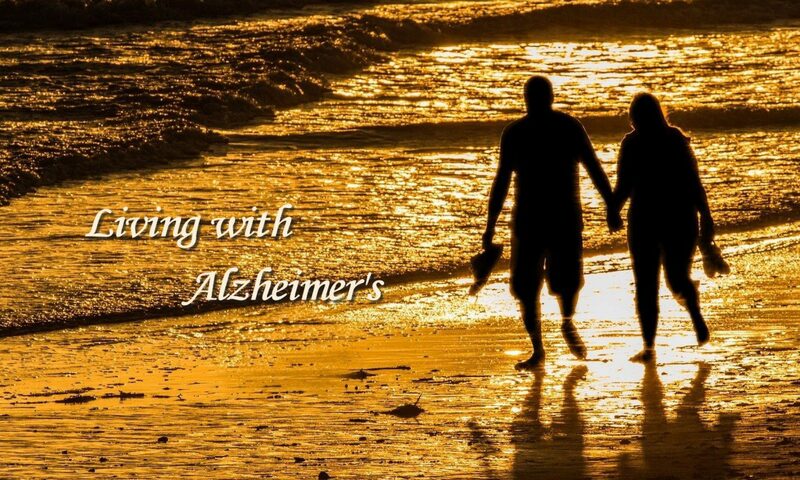 On the whole I think I do pretty well adapting to the changes required by Kate’s Alzheimer’s, but one thing I have not been able to fully let go of is happening right now. We had been out to lunch with our church friends, Angela and Marvin Green. We came back to our house after eating and had a long chat. We always have a good time with them although we don’t get together that often. After they left, Kate stayed outside to work in the yard. As usual, she didn’t change clothes. I am prone to protect my clothes and wouldn’t work outside in anything I valued. She doesn’t feel the same way. I don’t believe she was ever as sensitive (obsessive compulsive) about this as I am, but clearly the Alzheimer’s has meant she has little or no concern about soiling or damaging good clothes. On a few occasions (not many) I have said something to her about working in her good clothes. It never works; so I am holding off. She is seated on the ground digging in the flower beds. I don;t know what condition her slacks will be in, but I know that her work clothes look pretty soiled when she comes in. This is a little thing I know, but I feel the need to report it lest a reader think that I am more understanding than I really am. A number of times I have commented on the fact that Kate’s observation of things around her is impaired. She simply doesn’t notice things that are in front of her. This happens most often when there are a lot things in front of her. That makes it hard for her to see what it is she is looking for. I try to help by going to places around the house that I think from past experience are the likely places to find whatever she is looking for. Sometimes it works. Often it doesn’t. Something more dramatic happened last week when we were returning from a meal at Chalupas, her favorite Mexican restaurant. As we were approached a stop light , I noticed flashing red lights. Because it was dark I couldn’t tell exactly what it was until I got to the intersection. Then I noticed that a firetruck was blocking the intersection. Someone was directing traffic to turn right toward town. As I turned, I noticed that two cars had collided. I made a comment. It turns out that Kate had not seen the firetruck or the accident scene itself. This is a case where multiple red lights were flashing, cars were backed up. I don’t know what could be more noticeable. It has been a while since I have commented on the condition of Kate’s rooms (2 guest rooms and her office). I am glad to report that she has kept them in much better order in the past few months. That has changed in recent weeks when I believe she has been trying to arrange her clothes in some kind of order to make it easier for her to find what she wants. In the short term (and perhaps the long term as well) it is back to being about as messy as it ever was. The difference is that it appears to be directly related to her sorting her clothes in preparation to put them in her closets. Each room seems to change in that it gets cleaned up and then after a while, it returns to a similar disorderly condition. Yesterday her office looked pretty good. I went in there about an hour ago after my morning walk, and clothes were laid out on her bed. I asked if she wanted to go to Panera. She said she would but wanted to continue cleaning up. I decided to let her do that as long as she cares to. We can go to Panera anytime. I don’t know why she has tried to get her house in order, but I take that as a good thing. The big problem is that it goes pretty quickly back to its disorderly state.